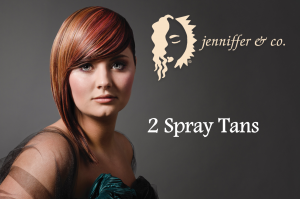 Jenniffer & Co. knows Everyone is eager to keep that summer glow no matter the time of year. Fortunately, you can achieve the right look with spray tans. With our hand- handle unit and technicians you can achieve an even application. There are also multiple shades to choose from. Before your spray tan service, it is important to shower and exfoliate as much as possible to ensure the best results. it is also recommended to wear loose clothing that will beneficial to wear after the spray tan has been applied. Aftercare: Once you’ve given your tan enough time to set in, rinse in warm water. Do not scrub or use super-hot water. After your shower, don’t forget to moisturize. It’s important to keep your skin hydrated to make your tan last longer and fade evenly. We recommend not showering or getting wet 8 to 10 hours after your spray tan has been applied.